Despite having to go through two unwanted playoff rounds to secure their place in Russia this summer, Australia fans can have high hopes going into group stage action. The Socceroos feared the worst after they were placed in pot 4 for the group stage draw but they will fancy their chances of matching their best ever performance in 2006 when they reached the round of 16 following the draw. Pitted against France, Peru and Denmark in Group C, Bert van Marwijk’s men will have their sights firmly set on progression to the last 16 and beyond. Australia had to come through two group stages and two playoff rounds to qualify for this year’s tournament so do not expect them to give up their place in the competition easily. Their gruelling qualification campaign began in June 2015 with a 2-1 away win over Kyrgyzstan. They went on to top their group in the second round, losing just once to Jordan on the way, but managed just a third place finish in the third round of qualification meaning the Aussies missed out on automatic qualification to Russia and had overcome two nerve-wrecking playoff rounds. First up was Syria, who they defeated 3-2 on aggregate after a tense 2-1 extra time win in the second leg thanks to a Tim Cahill brace. Mile Jendinak was then the hero as his hat trick helped Australia defeat Honduras 3-1 on aggregate to book a place at their fourth consecutive World Cup. Australia’s route to the World Cup has been longer than most but despite that, the coach who steered them through the arduous campaign will not be the one who leads them in Russia. Ange Postecoglou quit his role as Australia manager after victory over Honduras and in his place will be Bert van Marwijk, the man who guided the Netherlands to the World Cup final in 2010. This means the new boss will have had just four games in charge of Australia before their World Cup opener against France in June (although, two of those games have already been played to varying degrees of success, a 4-1 loss to Norway was followed by an impressive 0-0 draw against Colombia). Van Marwijk certainly has the managerial pedigree having coached Borussia Dortmund and Feyenoord amongst others but will his lack of time in charge of the Socceroos cost them when it comes to their performances in Russia? Either way, Australia will have a new manager after the tournament whatever the result with Sydney FC boss Graham Arnold already named as the Dutchman’s successor following the World Cup. To call Australia rank outsiders to lift the World Cup would be an understatement, they are currently at odds of 300/1 to go all the way in the latest World Cup betting odds, but reaching the last 16 could be seen as respectable achievement - seeing as the Aussies have only reached that stage once in their history. They start their World Cup campaign with arguably their toughest game first as they take on a supremely talented French side in Kazan on 16th June. Then come two games which could be described as more winnable for the Socceroos although they would be foolish to underestimate either Peru or Denmark. It may be the first time that Peru have qualified for the World Cup since 1982 but they had to come through a gruelling qualification campaign of their own having finished fifth in the notoriously difficult South America qualifying group and they then had to overcome New Zealand in a playoff. Likewise, Denmark trounced the Republic of Ireland 5-1 over two legs in their playoff to make it through to Russia and with Tottenham superstar Christian Eriksen in their ranks, it would be wise not to write off the Danish. The Aussies will be looking for their star players to perform if they are to have any chance of making it through the group stage. There’s no doubting that Tim Cahill is a legend of Australian football. He is the country’s all-time leading scorer and has scored in all three of the World Cups he has played in, including that wonder goal against the Netherlands in 2014. He also scored 11 goals during qualification for this summer’s tournament so his importance to Australia cannot be doubted. But despite all he has achieved, Cahill comes into the World Cup in arguably the worst form of his career. He has managed just sixteen league appearances all season with just one of those being a start. He also hasn’t scored a goal since his brace for Australia against Syria all the way back in October last year. The 38-year-old decided to leave Melbourne City last year due to a lack of game time following the A-League club’s loan signing of Ross McCormack but he has not found that game time easy to come by since he has left his homeland. 14 years after he left his first senior club Millwall, to join Everton, he rejoined The Lions in January of this year. It was a move for football romantics. Cahill now 38, back at his old club to try help them secure promotion to the Premier League and then lead the line for Australia in Russia. Except the reality has been quite different. Since his return to The Den, Cahill has managed just 63 minutes of action for the Lions spread across ten substitute appearances. To make things worse, the veteran picked up a three match ban for elbowing Fulham’s Ryan Fredericks in their most recent Championship clash. 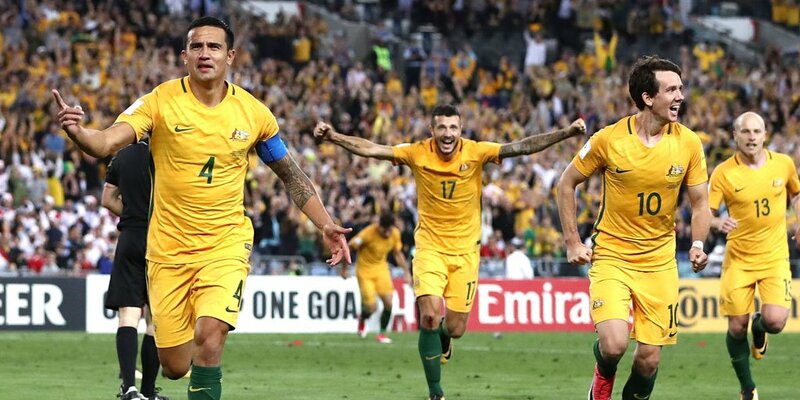 With Millwall failing to reach the playoff places, Cahill did not play another league game this season and his place in Australia’s starting line-up at the World Cup is under real threat, which could affect the World Cup betting tips. There are positives for Australia going into the tournament, however. Aaron Mooy has completed his first ever Premier League season with Huddersfield Town and he has earned plaudits with his performances in the middle of the park for the Terriers, scoring four goals and picking up three assists. Having been dragged into a late battle with relegation, Mooy will no doubt be a better player for the experience he has gained in the English top flight. Another player who has also played his first season in the Premier League this season is Brighton goalkeeper Matthew Ryan and he will be crucial between the sticks for Australia having impressed in the Seagulls’ debut season amongst the big boys. Elsewhere, the emergence of Newcastle Jets as title contenders in Australia has seen two players force their way into Socceroos contention. Dimi Petratos and Andrew Nabbout have both had breakout seasons firing ten goals each as the Jets reached the A-League playoffs for the first time since the 2009/10 season. The pair, both aged 25, made their debut for Australia during the friendly defeat to Norway in March and could offer serious attacking threat in the absence of goals from Tim Cahill. Australia are up against it this summer in Russia. The ageing Tim Cahill is not in great form, manager Bert van Marwijk has not had much time to spend with his new players and they limped through qualifying but Australia have always performed well as underdogs before (remember in 2006 when it took Italy a 95th minute goal from Francesco Totti to overcome the Socceroos?!) and they have a manager with real World Cup pedigree this time round. Write Australia off at your peril.